Are you contemplating a new fireplace insert for your home"Insure the perfect finish to the installation process with a Large Surround for Solstice/VFI33 Inch Fireplace Inserts by Monessen. 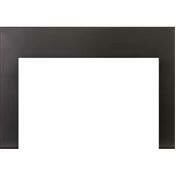 Measuring 50 inches wide and 35 inches tall, this large surround features sturdy stamped steel construction. It's sure to give lasting pleasure and enjoyment with its metallic black heat resistant finish as it enhances the decor of any room in your home. Give one a try today. Are the measurements for this piece outside or the inside? That is the outer measurement.